Extrano’s Alley put the U.S. homicide rate, from the FBI dataset, into a table. Someone else took that data and popped some historical events into it. 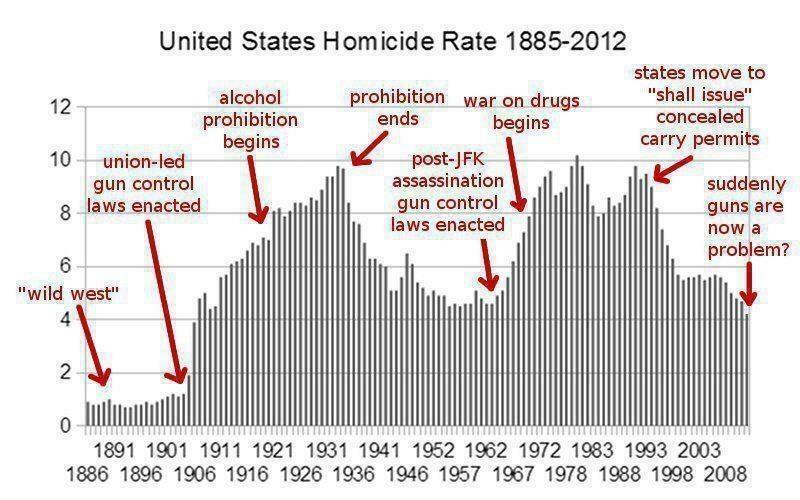 Such as when various gun control laws were enacted, when prohibition began and ended, and so on. Hat tip to the Political Hat. There’s a joke there, but lunch is over. June 22, 2016: Why don’t gun owners trust the left? Immediately following new of the Orlando shooting, the left’s finger nannies got onto social media and began trying to convince their friends to support new gun control laws—specifically, gun control laws that wouldn’t have stopped the Orlando shooter. You are 800 times more likely to die of gun violence if you have guns in the home. That is a fact. That is “in fact” a pretty huge margin. It was also, of course, completely false. When challenged on it, he immediately dropped it from 800 to 8—no longer a huge margin, but still with no references. Challenged on that, he provided a study that didn’t mention any 8 times greater likelihood of dying from gun violence, or any 8 times greater chance of anything whatsoever. It turns out that in order to reach “8 times more likely” he was adding two unrelated rates of increase together, and, as is often the case when the left begins to realize that their arguments are filled with bad logic and worse math, he accused those questioning him of his own failures. Now, no one expects random social media posters to be mathematically literate or even logical. What was amazing to me, though, was how closely his evolution in that one set of comments over a few days mirrored what gun owners get from the left in general, and has been getting, for decades—since before I stopped supporting gun control. Ironically, the study he quoted just before he petulantly clammed up in the face of a collapsing argument was a 1993 study by Kellerman, once a leading light on the left who followed the same pattern: first, a wildly outrageous statistic (43 times more likely to die from your own gun!) downgraded to a merely moderately outrageous statistic (2.7 times more likely to die from your own gun!) to, when it was pointed out that it looked like, from his tables, that there was actually a moderate benefit to owning a firearm, clammed up and refused to release his data. It was this latter study that provided the “800 times more likely!”, then, “8 times more likely!”, to “you’re a meanie, I just wanted to talk about larger issues”. June 15, 2016: But the rhetoric’s so much better here under the tragedy! At this point, it’s a pretty standard playlist. There’s a mass murder by someone who was enabled by the left’s policies. Most people voice their condolences and prayers on social media; but a handful on the left exploit the tragedy to call for more bad policies that wouldn’t have stopped the murderer to begin with but that would make it harder to defend against future murderers. When other people complain that they’re politicizing a tragedy to pass bad laws, they rant that prayers and condolences aren’t enough. Ignoring the real charge that their proposed laws would at best not change the outcome, and at worst, would make these tragedies easier to commit. 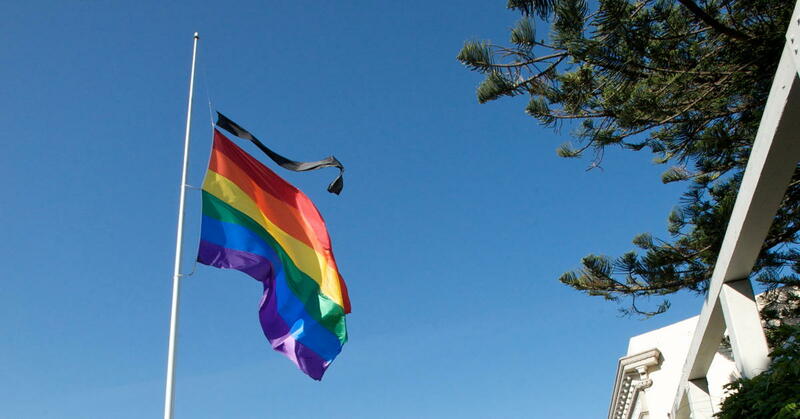 In this case, an Islamic terrorist took his religion’s hatred to heart and killed nearly fifty in the gay community in a gun-free zone. The security contractor he worked for didn’t seriously investigate him when coworkers complained he was going to kill people for Islam, because they didn’t want to investigate a Muslim. That would have appeared racist. Omar Mateen told his coworkers that he wanted to provoke a confrontation with the police so that he could die a martyr’s death. His coworkers complained to their superiors and to the FBI. When the FBI interviewed him, his excuse was that he’d only said this because his coworkers were racist. And it was accepted. The FBI closed the investigation and took him off the terror watch list.1 If they had left him on the watch list, they would have been warned when he purchased those two rifles, and could have taken another look at him. But that would have appeared racist. This is beginning to make The Black List look like a reality show. I love the show, but always thought the ease with which Red and his enemies infiltrate federal security services was completely unrealistic. I was wrong. Every time gun control fails in a high-gun-control state or gun-free zone, the left’s solution is doubling down on failure. 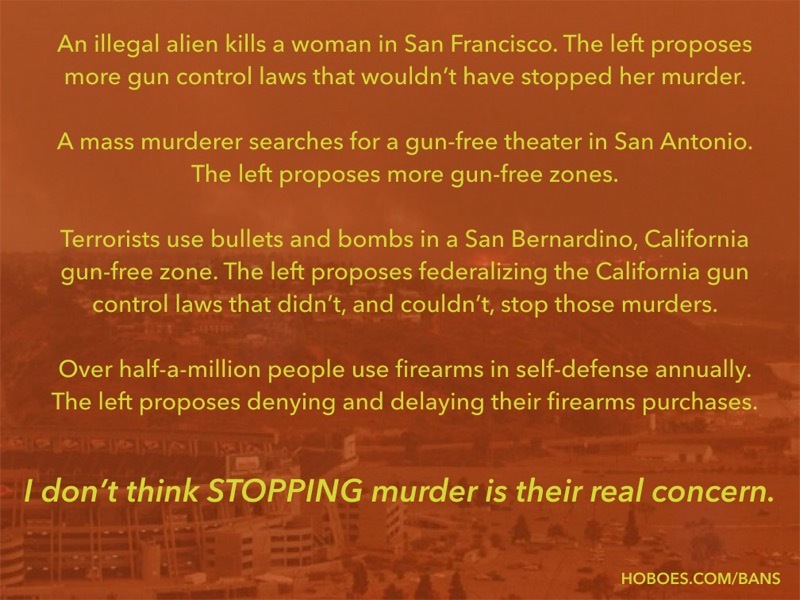 After the San Bernardino murders, the left has decided to do what they always do: use the murders to enact more gun bans that have nothing to do with stopping future San Bernardino shootings. For example, Bernie Sanders and his followers are pushing a bunch of items, every single specific one of which already exists in California or already exists everywhere in the United States. Significantly expand and improve background checks. Renew the federal rifle ban. End the sale of high capacity magazines. Close the gun show loophole. Close the loophole that allows domestic abusers and stalkers to obtain guns. The killers were not on any watch list. Expanding the background checks would not have stopped them, not unless the “expanded and improved” background checks would also stop everyone else who does not appear on any watch list.1 Unless they explain what they mean by this, it means nothing. Even if they had been on a watch list, they had connections with international terrorists. They would have had no problem circumventing a watch list. Improving the background check process is not actually a bad idea, as long as “improve” isn’t code for “delay and deny the law-abiding” as it usually is.2 But it would not have stopped these murders. California already has renewed the federal rifle ban. The San Bernardino killers’ guns were legally purchased in California, which has adopted and extended the federal ban. If it was legal in California it would have been legal under the expired federal law. Nor is there anything special about the model of rifles they used. They were just rifles, based off an old design easily manufactured anywhere in the world. Renewing the federal rifle ban would not have stopped these murders. California already bans more than ten rounds per magazine. Magazines are very simple devices and easily modified—which is what news reports are currently claiming the killers did—or even manufactured. Banning high-capacity magazines would not have stopped these murders. If we want to take away people’s civil rights to stop the showboat killers that seem to have proliferated since Columbine, is it worth it? We now know what went wrong. Let’s ignore the ghouls on Facebook and fix it. Whenever there’s a tragedy, there is a small cadre of people who frantically push solutions that never worked in the past and wouldn’t have stopped the current tragedy. They’re in a hurry to act before the facts come out that would let us craft a real response. Real prevention means solving real problems. That means waiting for the facts. As a potential triple-crown winner prepares for the third race of the Triple Crown, it’s almost impossible to place a bet in Atlantic City, NJ. Subtitled “Empire, Trade, and Prohibition”, this is an in-depth history of how prohibition came about in Britain, and ends up describing how marijuana prohibition came to the forefront of international attempts to ban opium. Will we still support prohibition when we all know someone who died because of it? U.S. homicide rate compared to gun control measures last modified June 29th, 2016.